Karlsruhe, Germany, October 24, 2011 – EIZO GmbH, Display Technologies today presents its new Large Monitor Manager, the LMM0802. The image manager enables digital images to be arranged flexibly on large-format monitors. The device is designed for use in interventional radiology, cardiology, and surgery, and is suited both to initial installations and subsequent integration in existing systems. Large-format monitors have become established in modern examination rooms everywhere because the flexible screen layout significantly simplifies and optimizes workflows. The LMM0802 is also able to integrate this flexibility into existing systems. 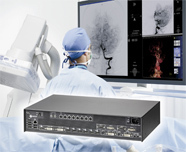 Thanks to its small size, the new image manager can be installed together with a widescreen 8 megapixel monitor on a ceiling suspension system in the operating room. Existing cabling can be used, eliminating the need for a completely new installation. The LMM0802 processes signals from various image sources. The signals are merged and can be displayed as needed on an 8 megapixel monitor. The image manager has 12 video input terminals. Of these, 8 terminals can process digital DVI (Digital Visual Interface) signals up to a resolution of 1920 x 1200, including Full HD (High Definition) (1920 x 1080). Additionally, there are two PAL/NTSC (Phase Alternating Line / National Television Systems Committee) and two analog terminals available. A maximum of 8 signal sources can be displayed simultaneously in 16 different windows on the monitor. The EIZO RadiForce LS560W and RadiForce LX600W widescreen monitors are suited to displaying the images. The LMM0802 also has a scaler output. Using this output, image content on the connected 8 megapixel monitor can also be displayed on a monitor with HD resolution or saved using a recording system. The new large monitor manager enables the concurrent display of various image sources on the connected monitor in user-defined layouts and sizes. Differing image arrangements suited to the respective application can be predefined. Using a touch panel console monitor like the CID1000P, the optimum display can be selected for the current work step. Alternatively, operation is possible using the iPad or a joystick. The LMM0802 user interface is intuitive, making costly user training unnecessary. Another key feature of the LMM0802 is its extremely short start-up time; the video signal is available at the output within 4 seconds. This guarantees immediate readiness, even after a power failure. A monitoring function for all the relevant components of the device and the possibility to communicate with the higher level of the system allows high functional safety. The monitor manager is designed in accordance with the special requirements for the medical field, so an ambient temperature of up to 45° C is permitted and the electrical safety is tested to IEC 60601. In addition, electronic components are selected which are available permanently to guarantee long-term system continuity. Production of the LMM0802 is planned for the beginning of 2012. The availability can differ depending on country, so please contact the EIZO subsidiary or distributor in your country for details. Visitors to Medica 2011 in Düsseldorf, Germany will be able to see the new product for the first time in the EIZO booth, Hall 10, #G41. EIZO GmbH, Display Technologies is based in Karlsruhe, Germany and is a leading manufacturer of visual display solutions for medical imaging applications. The company portfolio includes color and grayscale monitors of 1 to 10 megapixels, image management systems, and accessories. EIZO GmbH is a subsidiary of Eizo Nanao Corporation, a global leader in the manufacture of high end monitors for medical and graphic design applications, financial trading, and other markets. EIZO and RadiForce are registered trademarks of the Eizo Nanao Corporation. iPad is a trademark of Apple Inc.